I think the sediment of memory must resemble that room, and in my initial reading of the diaries there were times that I became aware of those long undistributed layers of sensory information, images I didn't know I could conjure, feelings I didn't know I still felt. Reading an entry, such as, "Went skiing on the bayou. Mitch kept flirting with me and I kept liking it." and an entire afternoon's experience would suddenly be revealed to me in full: the appalling heat, the relief of the breeze when the boat was in motion, Mitch's extremely short cutoffs and the fact that he wore no underwear. Scratch the surface and the past was there. Heartaches mostly. And the buried hurts and the humiliations that hurt and humiliated me all over again. January 10: I saw so many people die in a movie tonight (The Towering Inferno) that I started crying & praying for them. Mary called to say she is getting married and she wants me and Stella to be bridesmaids. January 12: Watched the Super Bowl with Tommy and Jackson. The strong attraction to Jackson is still there, but feeling so much love can't be a bad thing. August 8: President Nixon resigned. Made appointment to get my haircut. Because teen years are often defined by clashing priorities and emotional needs, many of Sartor's entries possess whiplash observations in the same sentence: family to God to losing weight to Prom! to solemn horse riding. It's very effective, and at times gripping writing. What I'm wondering about is this: a diary is autobiographical, but is it autobiography? 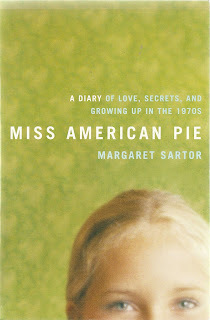 Sartor opens and closes her book with essays that put her diaries in historical context, and she writes about recovering them and present-day meetings she had with figures from her past, but she doesn't explore quite enough for me the implications of the self as subject, its possibilities and limits. There's a heft that seems to be missing from Miss American Pie, something I noticed the day after I finished reading it, when its resonances were less than I thought they would've been. Details alone do not make autobiography; those details need to be circled, opened, entered, doubted, accepted or denied. Interrogated, anyway. Oscar Wilde said that "Memory is the diary that we all carry about with us," but it isn't, because a diary is selective remembering. This is what I'm going to say now, not that. The not—what we elide, ignore, willfully or otherwise—matters as much as the this, perhaps more so. Sartor seems to recognizes this. In her closing essay she writes, "We do not know ourselves,"
This is what I have learned. Having read through my diaries, my private past has taken on qualities it did not have before. For one thing, it's no longer private. Autobiography is necessarily limited by the mind's locked drawers and the author's skewed perspective, but putting it plainly, the girl in my story would have been nicer and wiser were it not for the misfortune of written evidence. The lives described in my diaries, including my own, are depicted only in part, imperfectly, and seen only through my adolescent eyes. What I chose to record begs the question, to me as much as anyone, of what I left out, and why. A question I can't fully answer. But to paraphrase the Apostle Paul, until the perfect comes, the parts will have to do. Good stuff. I'd only quibble with this: the locked drawers aren't really locked, are they? If they are, writers can—must?—pick them. Very interesting, Joe. While her structure makes the book sound very artless and unsophisticated, her framing comments are very subtle and sophisticated. As a memoirist I'd love to have that stuff but have learned to be wary of what it can lock you into. Paging Vivian Gornick per the writer's persona and her real story. Exactly, Richard, I was thinking of Gornick while reading. 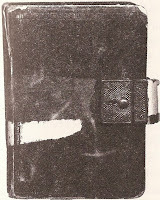 I'd love to experience reading my old diaries, but I never kept any.